Before I post these testimonies understand these testimonies come from real folks using Vivix these testimonies are not endorsed or tested by Shaklee.. it's just results some folks are getting. Everyone of us is different (meaning we aren't clones) and you may have different results. 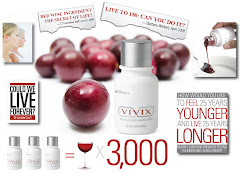 I just know Vivix anti-aging tonic works to protect and repair the DNA of the cells in your body. Who know's what it will protect and repair for you. anything out there. She has already discussed with me the increase in energy she feels and how the spots on the back of her hands have disappeared.